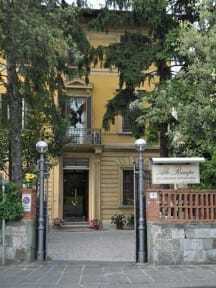 Villa alle Rampe i Firenze, Italien: Reservér nu! 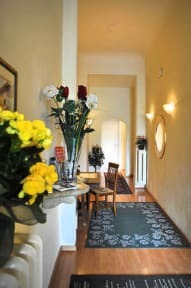 With five well groomed and nicely appointed double rooms, Villa alle Rampe, with its informal atmosphere, is a convenient and delightful place to hang your hat while exploring the world’s most magical Renaissance city. Each of our five double rooms are equipped with air conditioning, TV, hairdryer and private bathroom. Additional single beds for children are also available upon request. Each morning guests are invited into our breakfast room, or in the garden during the summer months, to start their day with coffee, pastries, cereals and juices before heading out to visit one of Italy’s most enchanting cities. We prefer payment by cash on arrival, VISA accepted (1 euro fee for prices lower than 100 euros). For late check –in (after 22:00) a charge of 10,00 euro will be added to the price.